An out of this world gastronomic treasure awaits you in this cozy gem of a little downtown restaurant in Ponce’s historic district. Only a few blocks away from the main square, its atmosphere could be very well described as “coffee house elegant”, with lots of interesting art and local memorabilia on the well decorated walls. A charming indoor tropical patio garden instantly captivated us, surrounded by some fascinating bamboo trees and other beautiful tropical plants. You will want to go back to experience the many interesting sounding combinations on their varied and well balanced menu. I tried the “mofongo” (typical Puerto Rican dish made with mashed plantains) stuffed with red snapper fillet in a mouth-watering garlic sauce. My partner had an equally excellent shrimp stuffed “papafongo” (special mashed potato house creation) and was particularly delighted by the original coconut sauce. Once we tasted their terrific STRONG coffee, we even got some kind after lunch treats on the house! The service was very good. Overall, the prices were mid-level for lunch. The only thing that it does not have is a parking, but that is not a problem since you can safely park for free at the Dora Colón Clavell Urban Park, just one block away. I'd highly recommend this Ponce restaurant as a "don't miss it". With its engaging owner (former local basketball star, César “Mandy” Bocachica) ever present, an exceptional service by a friendly staff is indeed always assured. 100% pure Puerto Rican coffee is certainly one of their assets, which they get FRESH from the authentic, local mill next door (Torrefacción Café Mayor). 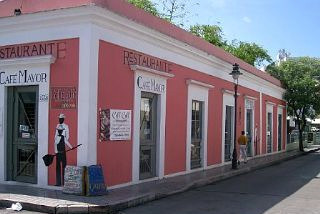 For more information visit Café Café Ponce's website or follow them on Twitter. Been there many times, just decided to walk in one day, and had very excellent food, terrific desserts, and i dare say the best coffee in town! I recently took four guests from Philly who wanted to eat some "Mofongo relleno" among other native foods. The service was excellent, the food was great and the prices were very affordable. I would most definitely recommend this restaurant to other people. Suggestion, try the chicken breast stuffed with ripe plantains. It was delicious. Join in and write your own page! It's easy to do. How? Simply click here to return to Ponce Restaurant Reviews.